The result: Improved handling and cornering-grip in performance driving situations. Manufactured from Eibachs' premium high strength aircraft-grade steel alloy that retains rate and shape over a lifetime warranty. Precision performance is assured, and each bar is finished with a long-lasting red powder coat finish. A great upgrade for the classic E30, makes the most of its narrow wheelbase and sharpens steering. 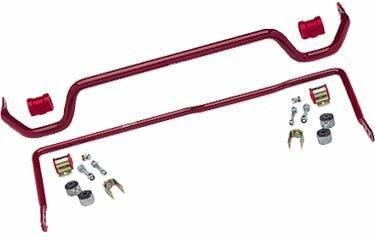 The Anti-Roll Kit comes complete with all necessary mounting hardware and instructions for easy installation, also includes new rear sway bar end links for quiet yet responsive performance, and new Eibach bushings for excellent feedback. One of our favorite kits! Complete your suspension upgrade with an Eibach ANTI-ROLL-KIT. A terrific match with sport springs, or coilovers; the Eibach ANTI-ROLL-KIT allows critical fine-tuning of your car's handling characteristics. From Murray Paulsen of Nelson, New Zealand on 9/7/2012 .